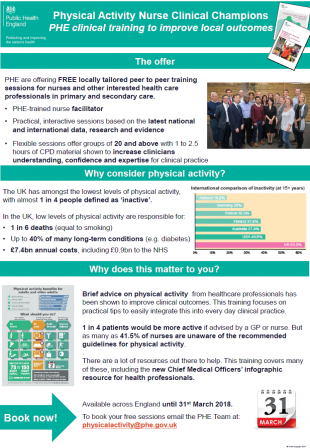 Nurse Physical Activity Clinical Champions are a key component of PHE’s Moving Professionals work programme, and are partially funded through a grant from the Burdett Trust for Nursing. Everybody Active Every Day, the national framework for physical activity, includes Moving Professionals as one of its four domains. This domain aims to increase the knowledge and skills of health professionals to provide them with the knowledge and skills to embed physical activity within their clinical practice. The Physical Activity Nurse Clinical Champions programme provides peer-to-peer and multi-disciplinary training. The Champions deliver face-to-face interactive sessions comprising presentation of epidemiological and biological evidence, small group work, problem solving tasks, and brief training in motivational interviewing focusing on practical application to clinical practice. I have been delivering the physical activity sessions to nurses over four months and in this time I have become aware of three themes that appear during the presentation. Firstly, nurses are generally very surprised about the lack of physical activity taken in the UK compared with other countries especially the USA. The slide in the presentation that demonstrates this has been powerful and I would suggest the graph on the slide was the best way to show the differences between the countries activity levels. This slide generated discussion and I followed through by asking questions about why they thought the UK was so inactive and asked for suggestions on how we could make some positive changes to encourage more physical activity among the UK population. The second theme that appears is not appreciating the benefits of resistance activities in the Chief Medical Officers Guidelines (CMO, 2011). The fact that we start to lose muscle and bone mass after the age of 30 years does not seem to be understood as a problem that can be prevented by building strength through activities such as carrying bags and yoga. Visual aids have helped to make the point such as a shopping bag and bags of sugar to demonstrate that it is not just about going to the gym to use weights for building strength. I also generated discussions around how we can encourage people to break habits that are not beneficial to health and encourage good habits; habit loops, 'the power of habit' by Charles Duhigg. Interestingly the nurses were considering how they could change their habits and build new physical activity ones. The third theme was around discussions about less sitting time. Talking to many nurses and especially the nurses from the nursing homes they said they were sceptical as to what physical activity these people would be able to do. However, after explaining about the effects of sitting for longer periods of time they understood that for residents who were not active if they sat less and were encouraged to move more these people had much to gain in health benefits. 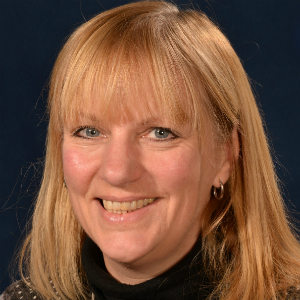 I work as a Diabetes Specialist Nurse in the community and I volunteer to take people who have diabetes, their friends and family on a walk around the Vale of Aylesbury on the second Sunday of the month. The benefits of physical activity to people with diabetes are many not least improving blood-glucose control and giving people a sense of well-being. Check out Public Health England's new Active 10 app as part of its One You Physical Activity campaign and help yourself and others improve their health.